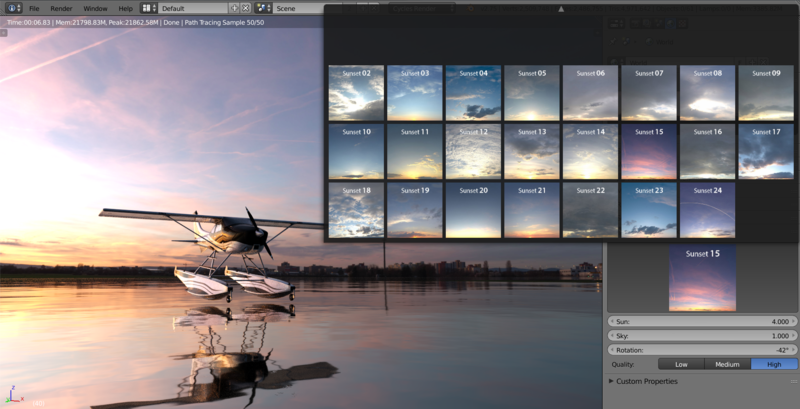 Notice: Pro-Lighting: Skies is now Blender 2.8 compatible! Just like a movie with bad audio, a scene with bad lighting is a waste of time. All the effort you’ve put into modelling and texturing won’t matter, if the lighting is horrible. Bad lighting undermines all your other effort and makes the whole render look amateurish. Good lighting on the other hand helps tell the story, effects the mood, and helps the viewer relate to it. If your lighting is good, the scene becomes significantly more believable to the viewer. 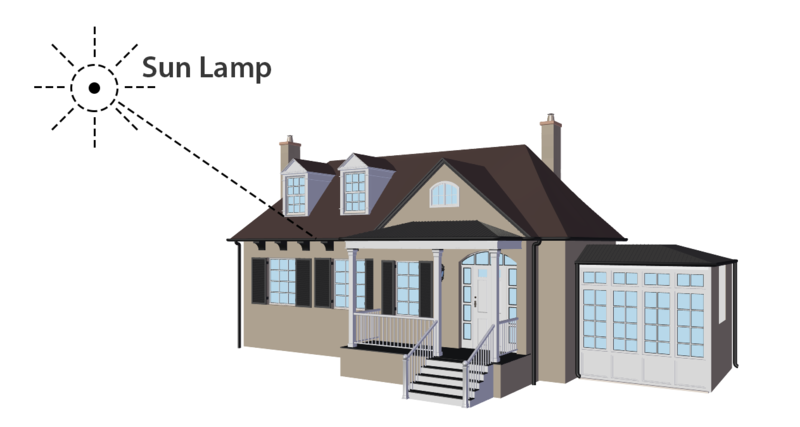 Many schools teach the “sunlamp” method for outdoor lighting. But while this sounds logical, real lighting isn’t a single light source. It’s millions. Step outside and look up at the sky, and you’ll see shades of blue from the atmosphere, reflected light from the clouds and a horizon gradient. It’s a dome of lighting in an endless variety of hues, saturations and values. A sun lamp is only one light source, when you should be using closer to a million. HDR lighting uses a single 360-degree photograph to light your scene instead of lamps. This gives you that infinite dome of lighting needed to create realistic lighting. And because it’s based on a real photo, it’s accurate to the real world. Not surprisingly, this has quickly become a standard for the industry. The average high-res HDR ranges from 200-400mb in size. Which is huge! While rendering an animation once, a scene repeatedly crashed despite our best efforts to optimize it. It was only when we looked at the lighting that we realized a single HDR sky was spiking the memory usage by a massive 4GB! As an artist you shouldn’t have to worry about whether your lighting will kill the render or not. Due to their large size, HDRs can take over a minute to load their own thumbnail. So unless you’ve memorized what each hdr looks like, you’ll need to wait for each one to load. Few things are as tedious as waiting for 30 hdr thumbnails to load. It’s also a burden to do even simple tweaks. Want to change the direction of the lighting? You’ll have to dig around in the nodes and try to remember that one field that allows you to do it. All these technical burdens take you away from what you should really be doing: creating art. Online HDRs range in price from around $30-$100 per sky! And since you’ll normally need a lot more than 1 to create different scenes, it quickly becomes out of reach for most artists (for example: 50 HDRs would set you back $1,500 on CGSkies). There are some free HDRs online. But you usually get what you pay for, as many are out of focus, low resolution or just poor quality in general. So with this in mind, I set out to create a solution. A way for artists to light their scene realistically, be easy to use and allow them to focus on making art. The tool we wish we always had: Pro-Lighting: Skies. 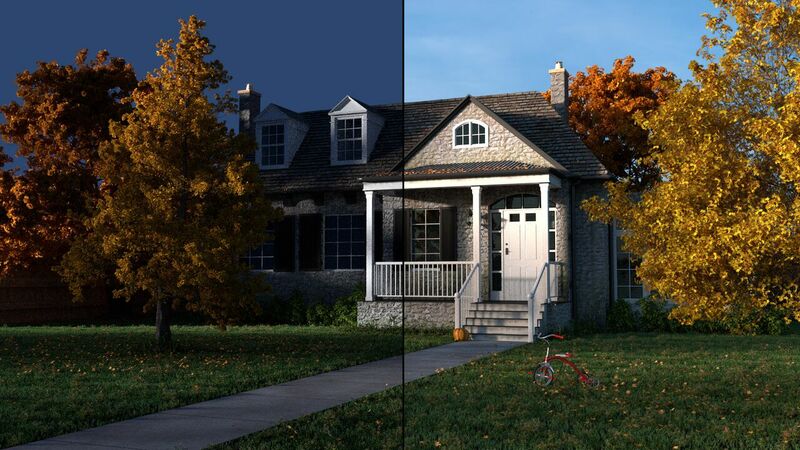 It’s the fastest, easiest and most realistic outdoor lighting available for Blender. It’s all the benefits of HDR lighting, with none of the downsides. 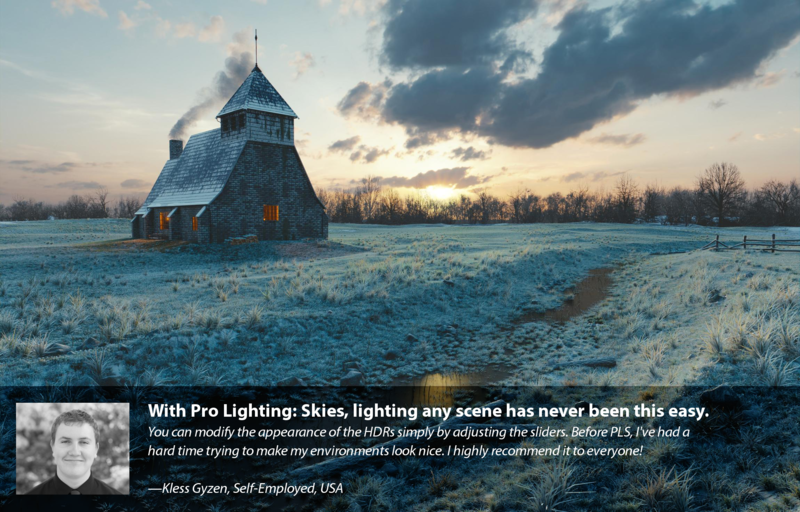 Pro-Lighting: Skies contains a collection of 80 HDR skiesthat were captured by professional photographers around the world. Includes sunny, cloudy, overcast, morning, sunset, nighttime and evening skies. Whatever scene you’re planning, you’ll find the right sky to suit. No more waiting for a single thumbnail to appear. No more fiddling with nodes. Just click the sky you want and it’s done. The process is so fast that it doubles as a tool for lighting exploration. Rapid-fire through dozens of skies in seconds, quickly exploring different moods and styles of lighting for your scene. 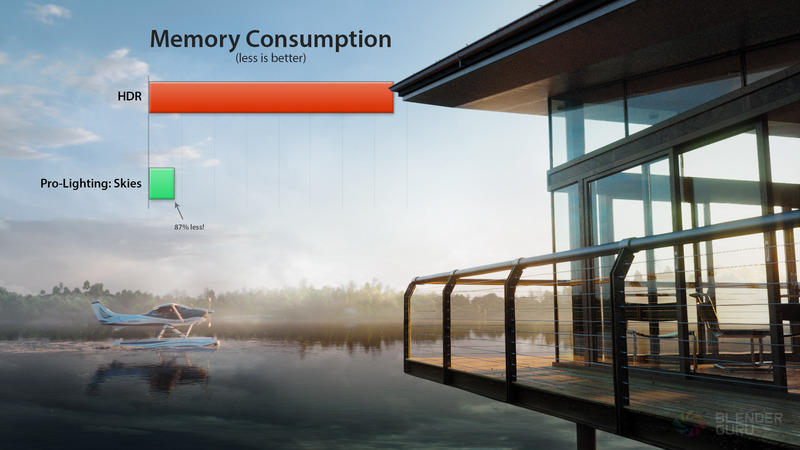 Pro-Lighting Skies has been optimized for use with Blender, saving up to 87% memory over standard HDRs. It does this through a clever usage of image formats and sizes to optimize how Blender renders it. Finally you can focus on your art, with the ease of mind that your scene will render. Instead of needing to open the node editor and dig through nodes just to change the brightness, Pro-Lighting: Skies makes it infinitely easier. All the values you’ll want to tweak are right there in the panel. Easily change the sun, sky light or rotation. Or change the saturation, hue or more settings in the advanced panel. All the control you need, with none of the headaches. We want to make HDR lighting available to the masses. So while we could price it at the industry standard, we’re deliberately pricing it well below. Typically, HDRs sell for $30-$100 each. So this pack of 80 HDRs would normally cost around $2,400 ($30 x 80 skies), and that’s without the add-on. 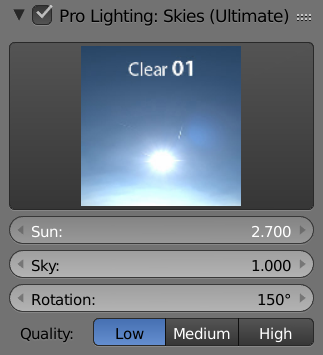 But Pro-Lighting: Skies is available today for just $197. That’s all you’ll pay for the piece of mind of having your outdoor lighting taken care of forever. Alternatively, if you’re an artist on more of a budget, you can get the Lite version for just $97 which features 30 skies instead 80. Step 1: Go to File>User Preferences then choose the Addons category at the top. At the bottom of the page, click the "Install from File" button. Step 2: Locate the zip ending in _addon.zip file on your harddrive, then click "Install from File." Step 3: Click the checkbox on right of the addon to enable it. Then click the arrow to expand the addon preferences. Step 4: In the box that opens, click the Install HDRs from zip button at the bottom. Step 5: Locate on your hard drive the zips ending in _HDR. The Ultimate version will have 5 and Lite 3. Step 6: A box will appear warning that it may hang while installing, just click okay. A tick should appear in the Preferences, indicating that the installation of all 94 HDRs are successful. -Make sure you're installing the right files for the right version. Ultimate has 5 zips, Lite has 3 and the demo only has 1. -Try selecting and installing the zips one at a time. Still not working? Email [email protected] and we'll walk you through it. So easy to use! A must have. Thank you. Great stuff, but I'm not too sure if this will ever be updated to 2.8. For the price, you'd expect it would be, but I haven't heard anything from Mr. Price about an update. If you are planning to stick with 2.7x, this is great. If not, you probably shouldn't buy this. I am really satisfied with this product. It finally made choosing the best lighting for my scenes way easier and faster: I applied these skies to a few scenes I had been lighting with plain hdrs and it gave them new life. Even in the lite pack there are many high quality hdrs with different lighting conditions, so I can choose to set my scene in the moment of the day and athmospheric condition I want. This look amazing! I just bought and tried for myself now! Perfect lights for realistic rendering, fantastic extra options, a realy big help for hobby artists. Thank you. Expensive, sure! But time is money and this add-on saves a lot of time! A must have, great time saver. best sky addon or environment hdri. good for exterior or interior. It's a very good addon! absolutely fantastic. I highly recommend checking out his blender tutorial videos on youtube as well. Perfect for outdoor scenes and quick test setups. Awesome addon for Blender. Easy to use and works incredible on ambient creation. Recommended! It is very fast to use. One click to activate and another to select. In the ultimate version you get many offers. But the price hurts. 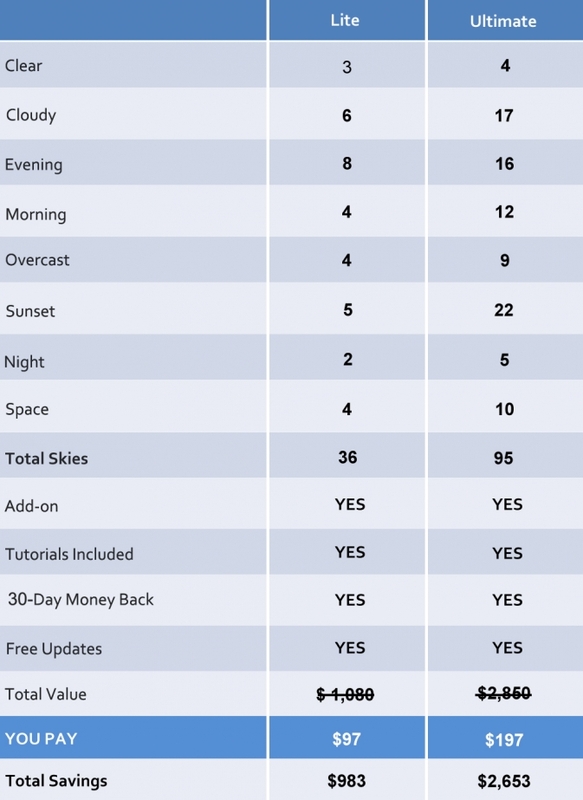 Simply amazing .. Now the ultimate version counts 95 skies! 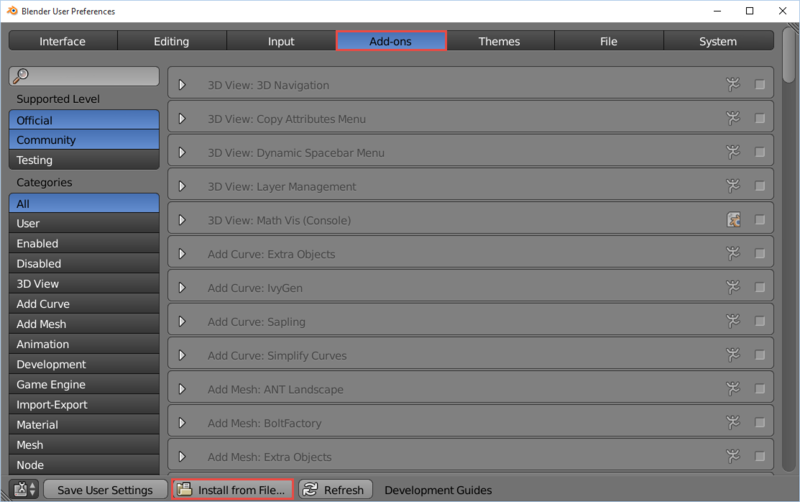 A must have Addon of out door renders! 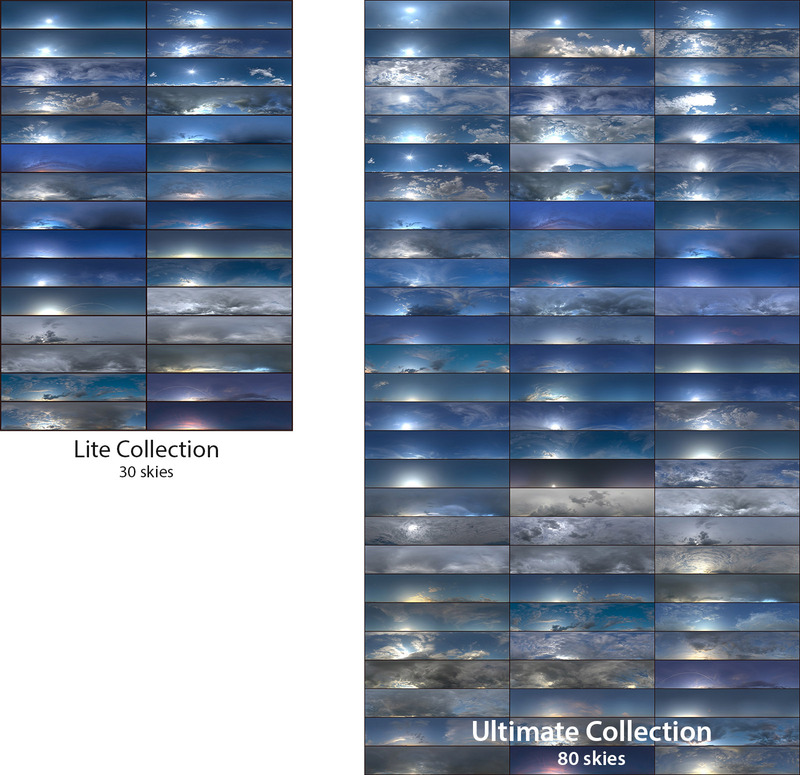 A lighter version of Pro-Lighting: Skies containing 30 skies only.